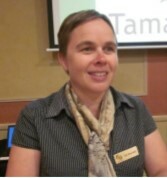 Our guest speaker of last week, Gill Basnett is one of two persons working for Tamar NRM. (Natural Resource Management.) Gill pointed out that Tamar NRM is not to be confused with NRM North, which is a larger organisation, and which receives substantial federal government funding. Tamar NRM is funded by the three northern councils—Launceston, West Tamar and George Town. It has been operating since 1998. Tamar NRM receives less funding than NRM North, but does not have the restrictions attached to federal funding, so can be more flexible and locally focused. It has several main areas of operation. The first is Sustainable Agriculture. This covers feral cat control measures, weed control, water quality monitoring, meat and livestock matters, soil improvement ands tree improvement. Another area of operation is Sustainable Living. This covers soil enhancement, better vegetables, better energy utilization and the staging of various expos. Another area of focus is Biodiversity. This area is concerned with plants and animals, weeds, weeding days, education events, cats and their danger to human health, especially to women, and pet management including microchipping. The George Town Coastal Management Group, The Plastic-Free Launceston Working Group and the Master TreeGrowers Group come under this heading. Another area of operations is Fire Mitigation and Biodiversity. This area includes fire management and survivability planning, preventative burning, the Backyard to Broadacres activity, involving Meat and Livestock Australia, education in schools, the Tamar Wetlands, the Boneseed Blitz and the Ragwort Raid. Another activity promoted by NRM North is the Tamar Valley Restoration and Landscape Learning Project. This project has overseen the planting of 32,000 tree seedlings. It has had the support of the three councils and has involved schoolchildren in the planting. 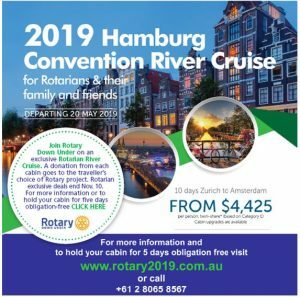 Tamar NRM has worked with Rotary, Lions and Landcare, as well as many other organisations. Activities have included willow clearance around the North Esk River, work at Waverley Lake and the NorthWest Regional Park. Also skink protection is part of the program. In response to questions, Gill said that feral and domestic cats are a significant problem and the government seems unwilling to really attack the issue. Gorse control is another issue that needs more attention from government and councils. There are hopeful signs. A ban on single-use plastic items is gaining increasing community support. This year’s Festivale used only compostable containers and utensils.